Lucky Dog Stamper: Welcome Little Boy! I have several baby cards to make for colleagues at work for this spring. 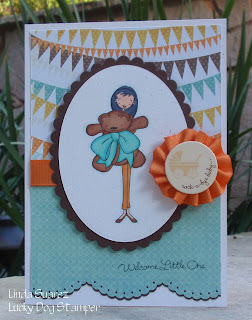 When I saw this My Favorite Things Wednesday Stamp Club sketch challenge, I knew it would be perfect for a baby card. I am off to walk Marley; we seem to be having an early spring here in NorCal. I know we need the rain but I am really enjoying the ability to take Mar up to the nice, green hills and letting her chase (I mean play with) those ground squirrels. 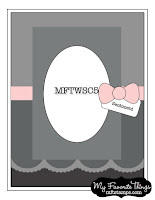 Stamps: MFT a la mode - Oh Baby! Linda this is DARLING!!!! Such a CUTE image and bright cheery baby card! Linda, great job on the card..I know it will be appreciated! Hope you and Marley had fun "playing" with the squirrels! Wonderful card Linda! I really like the orange ribbon medallion and the chipboard piece on it. Still doe-se-doe'n after all these years!